Fruit Fly Infestation - Where Did They Come From? A fruit fly infestation will typically occur during the late spring or summer months when we store an abundance of fresh fruits and vegetables inside our kitchen. Fruit flies are very small, ranging from about 3-4 mm long and a vast majority of them have distinctive red eyes. Under the right conditions, these small little flies can reproduce at an alarming rate which is why they seem to appear out of nowhere by the hundreds.....if not thousands. Simply referred to as the common fruit fly, the species Drosophila melanogaster are prolific breeders making them very useful in scientific research. In fact, many of us probably handled the flies during a high school science experiment. They only have four pairs of chromosomes and they lay up to 400 eggs at a time allowing rapid growth and easy observations. Fruit flies love to feed and lay their eggs on sugary, or decomposing organic materials, making those old fruits and vegetables on your kitchen countertop irresistible. The good news is an infestation is easy to control if you follow a few simple steps. To learn more, let's look at some preventative steps you can take to get rid of fruit flies in your home. Chances are the flies entered your home as eggs or larva inside the fruit you bought from your local supermarket, or since they're so small they simply flew through your window screen. The best way to control an infestation is to remove all available food sources. This includes damaged or rotting fruit on the kitchen counter, pop or alcohol bottles, spilled orange juice near the refrigerator, any old sponges or mops that are dirty, even an old bag of potatoes or onions you forgot about can breed thousands of flies. Fruit flies will lay eggs on any moist, organic rotting material they can find. So, in order to stop the fruit fly infestation you must remove their food sources. Although a bunch of bananas or apples on the kitchen counter looks nice and makes an easy snack, as they begin to decompose they're creating the perfect environment for the fruit flies. This doesn't mean you can't enjoy fresh fruits and vegetables, you just need to keep them inside the refrigerator and not on your countertops. 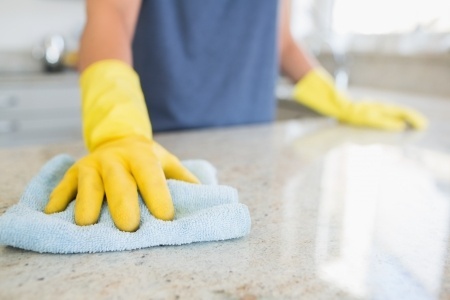 Also, wipe down your countertops on a regular basis with a mild kitchen cleaner to remove any spills or food. Take time to clean out your sink and remove any leftover food from the strainer in the sink drain. It's also important to take out your garbage on a regular basis. If you notice a cloud of fruit flies around your garbage, try investing in a garbage can that contains a sealable lid. After you have all the available food sources cleaned up, or placed in your refrigerator, the next step is to trap the fruit flies that are living in your home. Fruit flies are very easy to trap using a little apple cider vinegar and some common household supplies.....especially if you've already removed all of their easy food. 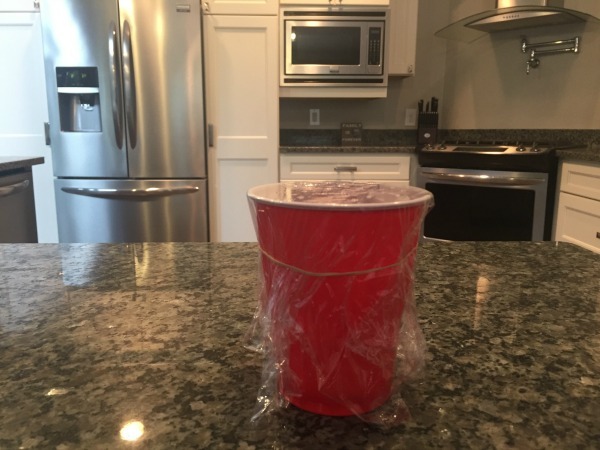 To make the homemade fruit fly trap you'll need a plastic cup, a few drops of liquid dish soap, apple cider vinegar and some plastic wrap. To see step-by-step instructions for making your own trap visit this link that explains how to get rid of fruit flies. 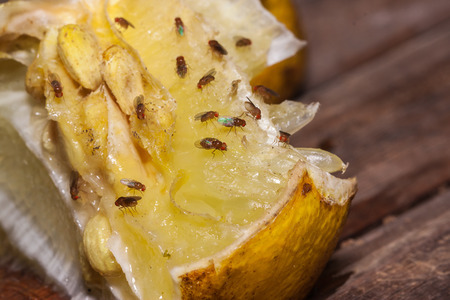 Controlling a fruit fly infestation is an easy task if you act quickly and don't let their numbers get out of control. Since they reproduce so fast, it doesn't take long for a few flies to turn into a hundred. If you notice a few fruit flies around your evening glass of wine or if you see some buzzing around your fruit salad, move all your fruits and vegetables to the refrigerator, wipe down your kitchen and set out a homemade trap. Then in a few days your fruit fly problem will be under control.